Black Bear Coatings & Concrete partners with New England’s top healthcare facilities to engineer cost-effective healthcare flooring options that meet and exceed rigorous industry standards. At Black Bear, we know that your healthcare flooring system has to offer long-term durability. Frequent replacement or patching is not an option. The demanding environments of clinics, hospitals, operating rooms, labs, long-term care facilities, and similar spaces requires flooring to withstand the challenges of 24/7 motion. 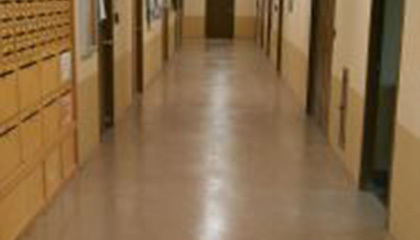 Industrial healthcare flooring needs to be low maintenance and slip resistant, as well as sanitary and seamless to ensure safety and endure the constant movement of foot-traffic, carts, beds and medical equipment. Our flooring contractors have extensive experience engineering solutions for the healthcare industry. Like the professionals we partner with, we work around the clock to ensure swift installation in a timely fashion to minimize disruption to facility operations. Black Bear has engineered solutions for several healthcare facilities in Massachusetts including: Leominster Hospital, NE Vet Oncology Group, and Springfield Hospital. Talk to Black Bear about designing and installing a cost-effective, durable surface for your healthcare and hospital floor spaces. Fill out the online form and a client representative will be in touch. Or, please call 978-405-0017. To learn more about industrial flooring for the healthcare industry, check out our guide to choosing the right flooring for life sciences.